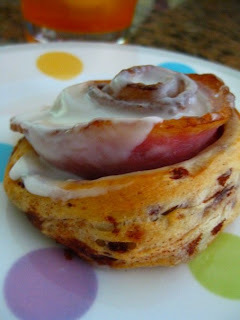 After posting about the Bacon Cinnamon Roll, this was something too good to NOT try. Results you ask? Here they are! 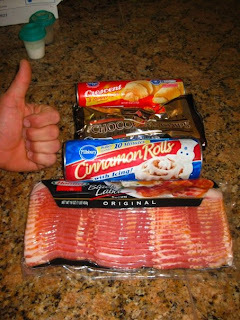 Breakfast of the champions, mini Pain Au Chocolate and Bacon Cinnamon Rolls. 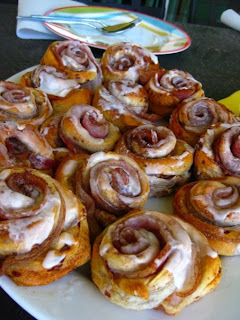 I went with the Pillsbury Cinnamon Rolls because who doesn't love a little poke in the tummy? The only problem that I didn't take into account, these Rolls are more like little balls of dough, not nicely rolled rolls, and lacking a rolling pin we had to make due with beer steins. I also sprinkled a mixture of Sugar and Cinnamon on top of the rolls after they were done, hoping that would add a nice caramelized crust effect to the finished product. After a nice 12 minutes or so of baking time, the salty sweet aroma filled the kitchen and they were ready for glazing. 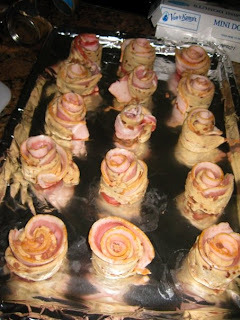 Simple, Salty & Sweet, the bacon was crispy at the edges and a little softer in the center. The milky frosting glaze topping sealed the deal.